This fresh Rosemary tree is such a refreshing gorgeous gift that you'll want one (or two) for yourself! This fresh Lavender tree is such a refreshing gorgeous gift that you'll want one for yourself! 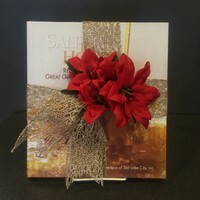 Salt to Honey: Recipes for Great Gatherings already gift wrapped and ready for gifting! Salt to Honey: Recipes for Great Gatherings paired with a fresh Lavender tree - perfect for Holiday gifting! Salt to Honey: Recipes for Great Gatherings paired with a fresh Rosemary tree - perfect for Holiday gifting!